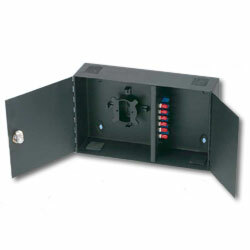 Wall Mount Fiber Optic Cabinet will accept up to 2 panels, 6, 8 or 12 port. Comes with mounting hardware, internal cable management and labels for accurate cable administration. Equipped with door lock and keys. Includes cable managment kit and hardware. Constructed of 18 gauge steel.